In a large skillet, heat the olive oil over medium-high heat. Add the onions and sugar, and stir occasionally, cooking until the onions are soft and golden brown (caramelized), about 20 to 30 minutes. (If onions stick to the pan, just add a little water.) Remove from heat and reserve. Preheat the oven to 400 degrees. On a lightly floured surface , roll out the dough to a 10x10-inch square and transfer it to a parchment-lined baking sheet. With a knife or pizza cutter, cut off a 1/2-inch-wide strip of dough from all 4 sides and reserve. Then, use a pastry brush to moisten the edges of the square with beaten egg. Place the reserved 1/2-inch strips of dough along the top of the outside edge of the dough square, overlapping the corners to form a border. Using a fork, prick the center portion of the dough as you would the bottom of a piecrust. Brush the entire tart crust with egg wash and place in the refrigerator for 15 minutes. Then bake for 10 to 15 minutes until the dough is puffed and golden brown. Remove the pastry and lower the oven temperature to 350 degrees. To assemble the tart, spread the caramelized onions in the center portion of the pastry. 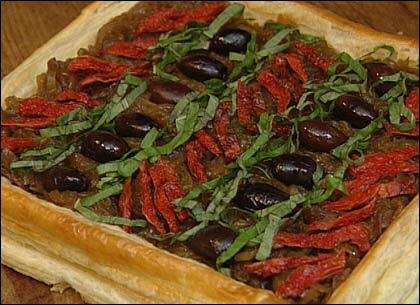 Arrange the dried tomatoes, olives and strips of basil in alternate stripes on top of the onions. Place the tart in the 350-degree oven for about 10 minutes, just until the onions are warm. Cut into thin strips to serve as an hors d'oeuvre, or into 4 pieces to serve as an entrée accompanied by a salad.